If you’re anything like me, you’ve dreamed of moving to the country, buying a piece of land, and supporting yourself off the land. It’s not a pipe dream, and there are totally people who do it! However, there is one important skill that you absolutely must learn before you can succeed in living off a farm income. Luckily for you, this is a skill that you can practice without any land at all, and will even HELP you save up for your dream homestead some day. In order to run a successful farm business, you’ll need to become a master of budgeting. Because our family lives off of two home based businesses, I though for a long time I would never be able to successfully budget. Finally, I learned how to have a monthly budget even when living on an irregular income. Hurray! Most budgeting advice tells you to list your monthly income on one side of a paper, and your expenses on the other side. If they don’t add up, get more income or cut out some expenses. Sounds simple, but it’s so NOT simple when you just don’t know how much money you will be getting or when it will finally show up! Having a monthly budget is also NOT simple when you add up your expenses that simply cannot be reduced and they’re so much more than your income that you just want to crumple the whole thing into a ball and cry. 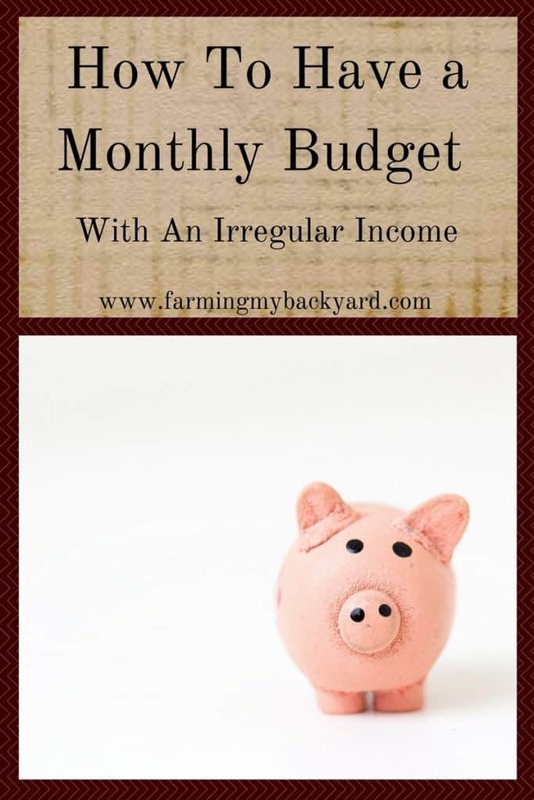 Monthly budgets are also difficult with farming because expenses aren’t the same every month. They can fluctuate just as much as the seasons do. Perhaps this month you need to pay for extra firewood, or last month it was time to send in the goat disease testing. Maybe you had plenty of rain this week, but the garden needs extra water for the next three weeks. Life is just not reliable the same way it is if you live in an apartment with an air conditioner, heater, and a potted plant! Despite the extra difficulties, you still REALLY need a budget! 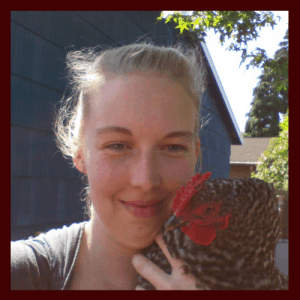 If you are already living on your homestead, those extra expenses can really sneak up and catch you by surprise. Surprise expenses can really cost you. Everyone has surprise expenses, but especially if you have livestock, you’ll need to be prepared for things like emergency vet care at the drop of a hat. If you depend on your homestead for your own survival or as a business, you can’t let a broken tool or crazy weather stop you. Having a solid monthly budget is crucial to surviving these sorts of everyday crises without creating more problems for yourself. I struggled with a monthly budget for years and years until one day I was reading a Dave Ramsey book. The book was helpful in many ways, but I already knew the budget advice wasn’t going to work for me. After I finished the book I was flipping through the appendix and I stumbled onto a worksheet about budgeting when you were self employed. I read it, and I was completely floored. It was SO simple, it made SO much sense, and I couldn’t believe I hadn’t figured it out before. Instead of starting with your income, start with your expenses. For most people, their income is the one they can count on, and the expenses are often based on choices you make. When you are self-employed, you have set expenses that MUST. BE. PAID. or else bad things will happen. So start with those non-negotiable expenses and make a list of them and put them in order of importance. Next, when you get some income in, start at the top of your list with your most important expense, and keep going down the list paying for things until you run out of money. Keep a running total as you go so you don’t accidentally pay one bill too many and overdraft yourself. Next time you get more income in, keep going down your list. The trick with this is you need to understand what is truly a priority. Saving is a priority. Charity is a priority. Food for your family is a priority. Keeping the electricity on is (probably) a priority. Netflix is NOT a priority. If you don’t have a savings buffer built up to tide you through the lean months, you’ll need to be ruthless in keeping your expenses low until you can essentially pay yourself a monthly paycheck out of your earnings. Now, you’re going to have to do this monthly, or perhaps even more often. Stuff comes up. That’s just part of life. That’s also why it is vitally important that on your priority list you include savings. Pay yourself first. Even if it’s just five dollars or fifty cents! Make it a habit, and increase it when you can. Also, credit cards are NOT an emergency plan. If you can’t afford to pay for something right now with cash, HOW ON EARTH are you going to be able to afford to pay that amount PLUS THE INTEREST on it? You can’t. It just digs you into a deeper and deeper hole. Because emergencies happen, and they keep happening. And they don’t conveniently wait until you’ve paid off the first emergency before dumping another one on your lap. Don’t pay interest on something you can even afford to pay for with cash. Thankfully, a little bit of attitude adjustment means that some things doesn’t have to necessarily be an emergency. You can be surprisingly resourceful when you put your mind to it! So many things we think of as necessities in our culture are actually just tools. They’re tools to help us do a necessary thing in a faster or better way. For example, you don’t have to have a washing machine. You do have to have clean clothes. A washing machine is just a tool to help you clean your clothes. As homesteaders we benefit from a certain creativity that helps us make do with what we have. This is an invaluable skill when you’re making do with a less than ideal situation while you save up enough to improve things. Can You Be Car Free With Kids? Is Having a Monthly Budget Worth The Effort? I’m not going to lie. Keeping up with a monthly budget does take a little time. No matter what budgeting method you end up using, you have to USE it to get any benefits. But there sure are some awesome benefits! When I figured out how to us a monthly budget on our sporadic income, it was a game changer for our family. By keeping a budget we have been able to pay off the rest of my school loans and send my husband back to school. We have been able to purchase a great used van for cash that has been quite the workhorse for our family. We’ve been able to purchase a larger property in a cheaper state, (Related Post: How To Move To A New Homestead). If you don’t have a budget it can feel like all your money is spent before you get it, especially if you have an irregular income. A simple budget can help you make sure that the most important things aren’t getting pushed aside by the seemingly urgent ones. No matter what your income level, when you prioritize, get creative, and cut out the things that aren’t as important or necessary, it’s amazing what you can do!